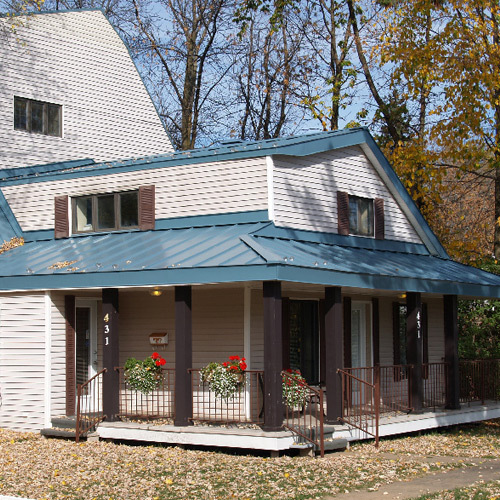 A metal roof is fully recyclable and has a lifespan of 50+ years. They are fire- and weather-resistant, rust- and rot-proof, will not curl or buckle and require minimum maintenance, so you will not need to replace it. Providing, of course, you have it installed by professionals. To make sure your metal roof is leak-proof and properly aerated, contact the Toitures PME professionals. The cost of installing a metal roof is fairly reasonable. Also, due to the fact that it has a far longer lifespan than most other roofing materials, it is one of the most cost-effective options available. A metal roof will also increase the value of your home. Not only will a durable, high quality metal roof boost its value, it will enhance the appearance of your entire property. Check out the wide range of colours and models for the style that suits you. Highly trained Toitures PME employees have in-depth knowledge of the products they work with and can meet all your roofing needs. Call on the experts when selecting the colour of your metal roof, based on the building’s architecture, location and the desired effect. When you choose Toitures PME, you benefit from the advice and experience of our teams throughout the entire project.